School buses are for more than just transporting kids to and from school. 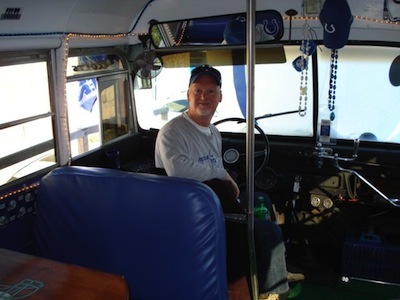 In fact, for superfan Diana Weaver, a retired school bus became a symbol of her Colts pride and a shelter for her avid tailgating. "It's the most fun you'll ever have on a school bus!" Diana said. In 2009, Diana was faced with an interesting offer: Did she (and 3 of her closest friends) want to purchase a 1973 Chevrolet school bus? The bus shuttled students in Brownsburg to and from school for years. Upon its retirement, it became a church bus. When it was no longer needed, the bus went up for sale. Diana was out to lunch with co-workers when one said, "You're the top tailgater I know. 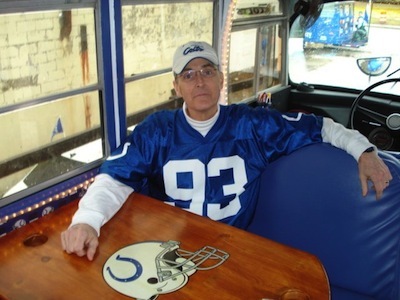 You should buy a Colts bus my buddy's got for sale." After having a mechanic give it a once-over, Diana and her friends were in. 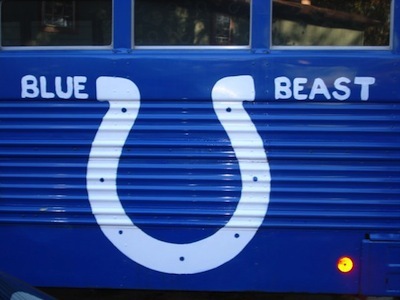 The bus was blue and boasted the Colts horseshoe on the side when it was purchased. But Diana and her friends decided to make it the ultimate tailgating party bus. That required stripping it down and cleaning before they painted over the original pale green interior. 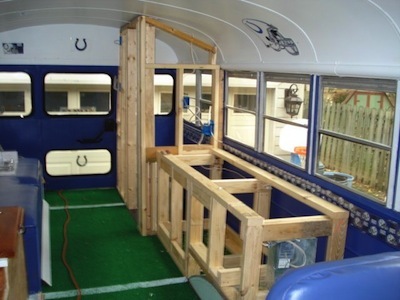 They scoured the Internet for party bus ideas and worked with a carpenter to build the ultimate tailgating site. They opted to use 7 of the original vinyl seats, which now help create 2 full booths for people to sit in (which is convenient for snacking or playing cards). It also includes sidebench seating (with storage beneath to hold the outdoor canopy and lawn chairs), full indoor-outdoor carpeting (striped for yard markers), and built-in custom cabinetry. 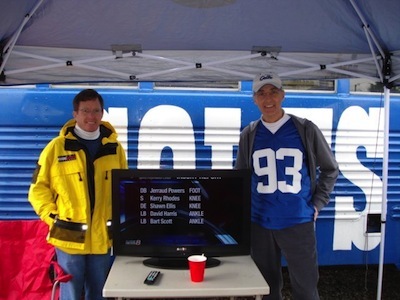 A counter with plug-in allows for crock pot cooking, and a flatscreen TV with an outdoor HD antenna allows you to watch the Colts play, even if you happen to be on the road. There is a fully-functioning bathroom inside, and blue/white rope lights add to the decor. The whole remodel took a few months of work, but they had it ready for the first home game of the 2009 season. Outside the bus, Diana and her friends cook out on the grill that rides on the back of the bus. They have a blue pop-up tent that provides cover, royal lawn chairs for seating, and Colts inflatables to help with the ambiance. Over one of the wheel wells, they installed a utility sink that is insulated with cooler material and built a cabinet around it (which conveniently holds 4 cases of drink). 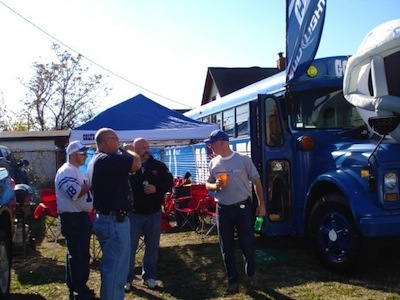 The bus is affectionately known as the Blue Beast, a name that came painted on the side. It is stored at a railroad station on the Southwest side of Indy. The Blue Beast is currently running on its 3rd engine. The bus holds 17 people (including the driver). The blue horseshoes mounted on the white cabinets inside came from a horse farm and were actually used on horses! Not surprisingly, the bus tends to draw a crowd wherever it goes. "People always want to tour it," Diana said. "We let them, but always have to say 'No, you can't eat our cheeseburgers or use our bathroom,'" she laughed. Diana and her friends have taken it to a Jimmy Buffet concert at Klipsch Music Center and to Broad Ripple for a bachelorette party. "People forget that fan is short for fanatic," Diana said. 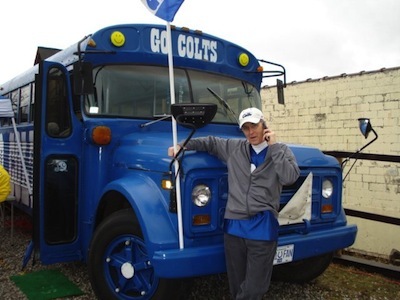 "For me, owning this bus is the ultimate sign of a fanatic." Despite all the fun the Blue Beast has brought into Diana's life, the bus is currently up for sale. 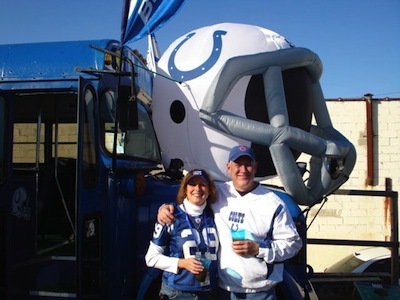 If you are a Colts fan who loves to tailgate and share the experience with others, you could be the proud owner of the Blue Beast and all its contents, down to the fuzzy Colts dice and team salt/pepper shakers for the low price of $4,000. As Diana says, "It ups the fun party factor associated with being a football fan by 100%!"